June 8, 2015 - NOAA scientists clearing the Pacific Ocean of discarded fishing nets and other dangerous trash found a green sea turtle still alive but entangled in a net. The divers were able to cut the net and free the turtle. Mark Manuel, the operations manager of NOAA's Coral Reef Ecosystem Division's Marine Debris Project in the northern Hawaiian islands, describes the untangling. Read more about NOAA effort in battling an 11-ton fishing net found off of Hawaii's coast. 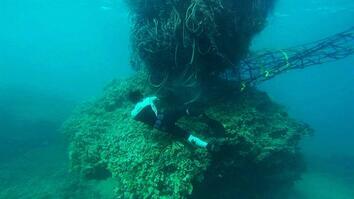 Watch video of divers removing an 11-ton fishing net. Our primary objective is to survey and remove derelict fishing gear, specifically nets, for the purpose of removing entangled matter. 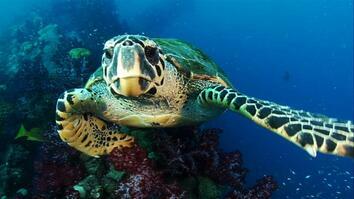 And in some cases we’re fortunate enough to get on scene to find turtles or monk seals entangled. In this case we located the net first and then we realize that there was a green sea turtle entangled on the other side. And who knows how long he would’ve survived being entangled. But we're fortunate enough to get a boat team on it and cut it away carefully. 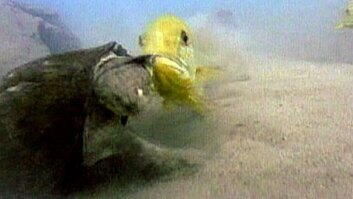 And as you can see by the video it was a very enlightening feeling to see it actually swim off on its own and, um, feeling that we just save one turtle. It was a bonus effort and at the end of the day we also remove the net. So it was a win-win situation for us.